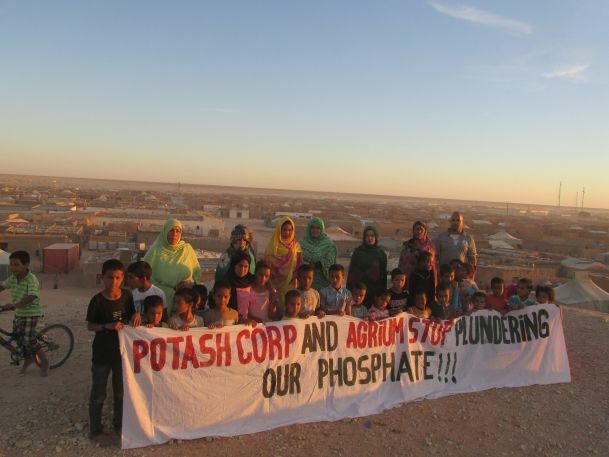 Two Canadian companies, Agrium and PotashCorp, were behind two thirds of all imports of phosphates from occupied Western Sahara last year. WSRW today launched its annual report of the controversial trade in Western Sahara's white gold. 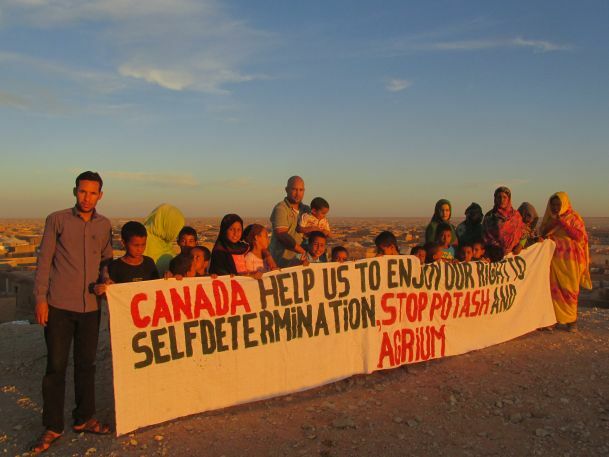 Between them, the Canadian companies Potash Corporation and Agrium Inc. accounted for 64,5% of all purchases from Western Sahara during the year of 2015. 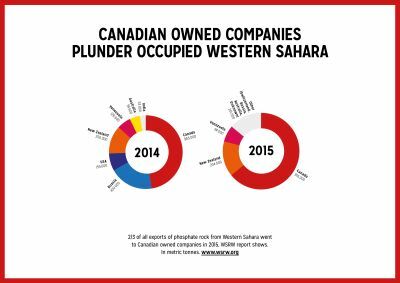 This can be read in the report P for Plunder 2015 published today by Western Sahara Resource Watch. The report traces all the shipments of phosphates rock from occupied Western Sahara last year to ports overseas, and reveals the role of importers internationally in the controversial trade. The illegally exploited phosphate rock is the Moroccan government’s main source of income from the territory which it holds contrary to international law. 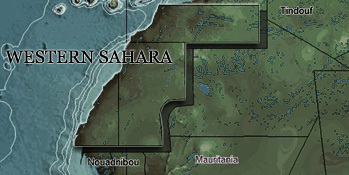 Representatives of the Saharawi people have been consistently outspoken against the trade, both in the UN, generally, and to specific companies. The list we present in this report is complete for calendar year 2015, naming all shipments of phosphates from occupied Western Sahara. The report details a total exported volume from Western Sahara in 2015 at 1.41 million tonnes, with an estimated value of US $167.8 million, shipped in 30 bulk vessels. That constitutes a decline in sales since 2014, the report shows, and is probably the lowest export volume in years. A trend of fewer and fewer multinational companies being involved in the trade emerges. The only three multinational companies participating in the trade today are Agrium, PotashCorp and to a smaller degree Australia's Incitec Pivot. None of the involved companies have ascertained whether the trade is in line with the wishes of the people of Western Sahara. Investors are also concerned that the companies are depleting the phosphates reserves while the territory is still under occupation, and that the proceeds will not benefit the people of Western Sahara until a settlement of the conflict is found. The report attributes the purchases of Morocco’s production in Western Sahara in 2015 to eight identified and one unknown importers in eight countries around the world. It is worth noting that, in 2015, the previous large scale purchaser Innophos did not import to Mexico. Another perviously important importer, Lifosa, announced in January 2016 its termination of imports from Western Sahara, after having reduced the purchases significantly in 2015. All three stock exchange registered companies - Agrium, PotashCorp and Incitec Pivot - have been subject to blacklisting by ethically concerned investors because of this trade. Of the remaining five companies not registered on any stock exchange, two are farmer owned cooperatives in New Zealand, two are fully or partially owned by the Government of Venezuela, and one is privately owned. Similar P for Plunder reports were also published in 2014 and 2015. WSRW calls on all companies involved in the trade to immediately halt all purchases of Western Sahara phosphates until a solution to the conflict has been found and the Saharawi people have been assured the exercise of their fundamental right to self-determination. Investors are requested to engage or divest unless companies commit clearly to withdrawing from the trade. Photos below are free. No credit needed. Click on photo for high resolution pop-up version.